Hi, I'm Pastor Isidro Ocampo and the Ski Chaplain for "The Resort Ministries of Mammoth Community Church." Every Sunday,during ski season and before our regular church service (weather permitting), I make the rounds of Mammoth Mountain's ski areas: Main Lodge, Mill Creek, Canyon Lodge and Chair 15, putting up these signs. "Why do it? ", you may ask? Because at any time on the "hill" you might hear 5 different languages from all over the world and meet someone from ever state in the Union. These are people who need Jesus Christ as their Savior. 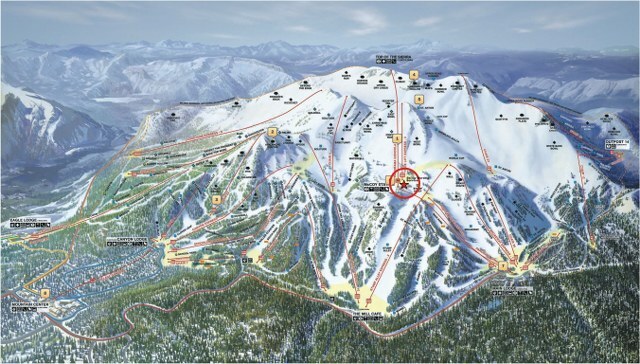 Mammoth Mountain Ski Resort presents a one of a kind opportunity, to reach the world for Christ. My wife and I could not become foreign missionaries because of health concerns. Instead, God brings the world to us. When people attend our ski-services it is a bit like a Christian summer camp. They are out of their usual environment, they are relaxed, they have been awed by the beauty of the wilderness that surrounds them, and they have a sense of humility and their own mortality. And, they listen and often respond. Many young people from various nations and walks of life work at the mountain. Usually they come for two reasons, to ski and have fun. They often find themselves faced with some of life's most important decisions and their lives will be changed forever. It is true that some only think of and feel the need for a good time but we want to be there for them too when life hits them full in the face. Mammoth can be a very dark place at times. I have met several Christian young people on the hill who were at the cross-roads of there Christian experience. I want to be there for them too. Please pray for these dear people. And pray for me too, that they will not see a mere man offering another philosophy but rather, a mere man sharing the very truth of God which they must have! Pray that God will open doors for great ministry this season. My friend Ed is the lead lift operator for chair 21. He wants to see all of his "lifties" become Christians! Together we are going to especially concentrate on chair 21 but also attempt a Bible study for all "lifties." Pray for us this season. That we would be creative and effective in reaching the Mountain. Pray also for all of the administration, and the safety of all.